If you are faced with a dishwasher that refuses to drain, the problem is likely with either the drain line or the drain hose. Note: before investigating the problem, shut the power off to the dishwasher. Water and electricity don't mix. Then wait until the water cools before checking some issues. First, look at the drain hose itself. Check it for any kinks or anomalies that could be keeping water from cleanly draining through. Fix the problem as necessary. Next, remove the strainer (located underneath the bottom spray arm) and clean it thoroughly with a brush). If neither of these solves the problem, it is likely a clog in the drain hose, or a faulty part. Call a professional for further inspection. If you are faced with a dishwasher that refuses to drain, the problem is likely with either the drain line or the drain hose. Note: before investigating the problem, shut the power off to the dishwasher. Water and electricity don't mix. Then wait until the water cools before checking some issues. First, look at the drain hose itself. Check it for any kinks or anomalies that could be keeping water from cleanly draining through. Fix the problem as necessary. Next, remove the strainer (located underneath the bottom spray arm) and clean it thoroughly with a brush). If neither of these solves the problem, it is likely a clog in the drain hose, or a faulty part. Call a professional for further inspection. If your dishwasher refuses to do the only job it has (wash the dishes! ), you have a few solutions at hand. First, make sure power is running to the appliance. Check the breaker box to make sure the circuit breaker hasn't tripped. If this doesn't work, the problem could be with a misaligned door switch. Jiggle the door switch to ensure that it is locking into place. Many dishwashers won't run unless the door latch is completely closed. If neither of these is the problem, consult a repairman. If you're getting dishes back from the dishwasher that still look as though they need to be cleaned, the problem likely stems from your loading technique. Make sure the dishes are loaded in such a way that they do not block the spray arms or the soap dispenser. 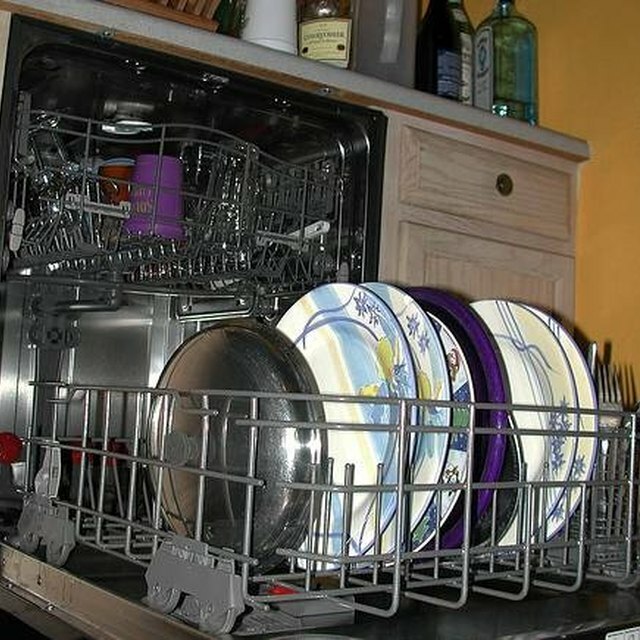 An overly full dishwasher is a common cause of decreased efficiency. If this isn't the problem, play with the amount and type of detergent you use. Harder water requires more detergent. Finally, avoid using other sources of water while the dishwasher is running. You can steal water pressure from the dishwasher, making it more difficult for the appliance to work properly.